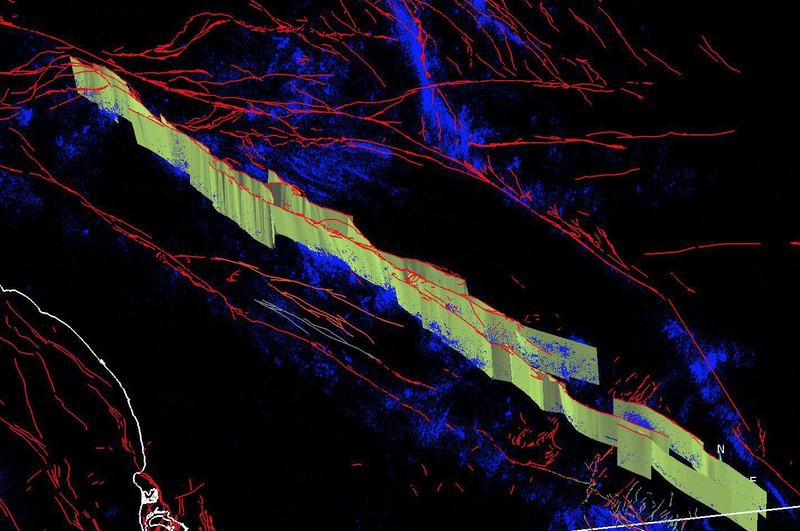 The Unified Structural Representation group develops three-dimensional models of active faults and earth structure (velocity, density, attenuation, etc.) for use in fault-system analysis, ground-motion prediction, and hazard assessment. This year’s efforts will focus on (1) making improvements to existing community models (CVM, CFM) that will facilitate their uses in SCEC science, education, and post-earthquake response planning; (2) developing methods to represent smaller scale features, such as stochastic variations of seismic velocities and attenuation structure; and (3) improving IT tools that are used to deliver the USR components to the user community. Community Velocity Model (CVM). Improve the current SCEC CVMs, with emphasis on more accurate representations of Vp, Vs, density, attenuation, and basin structure. Incorporate new data (NOTE: May choose to highlight specific items following discussions at the Annual Meeting.) into the CVMs with validation of improvements for ground-motion prediction. Perform waveform and geophysical inversions for evaluating and improving the CVMs. Develop and apply procedures (i.e., goodness-of-fit measures) for evaluating updated models against observations (e.g., waveforms, gravity, etc) to discriminate among alternatives and quantify model uncertainties. Community Fault Model (CFM). Improve and evaluate the CFM and statewide CFM (SCFM), placing emphasis on defining the geometry of major faults that are incompletely, or inaccurately, represented in the current model, and on faults of particular concern, such as those that are located close to critical facilities. Refine representations of the linkages among major fault systems. Extend the CFM to include spatial uncertainties and stochastic descriptions of fault geometry. Evaluate the new CFM version (5.0) with data (e.g., seismicity, seismic reflection profiles, geologic slip rates, and geodetic displacement fields) to discriminate among alternative models. Update the CFM-R (rectilinear fault model) to reflect improvements in the CFM. Improve the statewide CFM in regions outside the SCEC CFM in coordination with the appropriate agencies (e.g., USGS for central and northern CA). Unified Structural Representation (USR). Develop better IT mechanisms for delivering the USR, particularly the CVM parameters and information about the model's structural components, to the user community for use in generating and/or parameterizing numerical models. Develop improved representations of and user interfaces to the CVMs in support of additional features, including characterization of uncertainties and small-scale features, and scalable computing (laptops to large scale clusters). Develop new tools and formats for making the CFM geometries and properties available to the user community. Generate maps of geologic surfaces compatible with the CFM that may serve as strain markers in crustal deformation modeling and/or property boundaries in future iterations of the USR. These efforts should be coordinated with SCEC CME efforts. The Unified Structural Representation (USR) Focus Area develops models of crust and upper mantle structure in California for use in a wide range of SCEC science, including strong ground motion prediction, earthquake hazards assessment, and fault systems analysis. These efforts include the development of Community Velocity Models (CVM's) and Community Fault Models (CFM's), which together comprise a USR. In partnership with other working groups in SCEC, the USR Focus Area also helps support the evaluation and improvement of these models through ground motions simulations, 3D waveform tomography, earthquake relocations, and fault systems modeling. Refinement of the SCEC Community Fault Model (CFM) for southern California based on relocated seismicity catalogs and detailed fault traces in the USGS Quaternary Fault and Fold database. The latest updates include significant refinement to fault representations in the Peninsular Ranges, Mohave region, Santa Barbara Channel, and Western Transverse Ranges. These refinements include the faults systems that are the focus of the SCEC Special Fault Study Areas, and will be released in a forthcoming new model version. Completion of the first fully-evaluated Statewide Community Fault Model (SCFM v. 3.0), which involved peer review of the northern California fault representations. These faults were combined with the latest iteration of the southern California Fault model (CFM 5.0) to comprise the new statewide model. Development of new sets of regularly gridded representations for the fault included in the southern California CFM, to facilitate their use in earthquake simulators and other modeling applications. Release of a new version of the SCEC southern California USR, which includes the aforementioned CFM's and an updated version of the SCEC Community Velocity Model (CVM-H 15.1.0). Development of a first iteration Central California USR, including new representations of the Central Valley and Santa Maria basin structures that are compatible with fault representations in the SCEC SCFM. This new model is intended to support SCEC's Central California Seismic Project (CCSP), which will use these new structural representations to facilitate 3D waveform inversion studies. Figure 1. 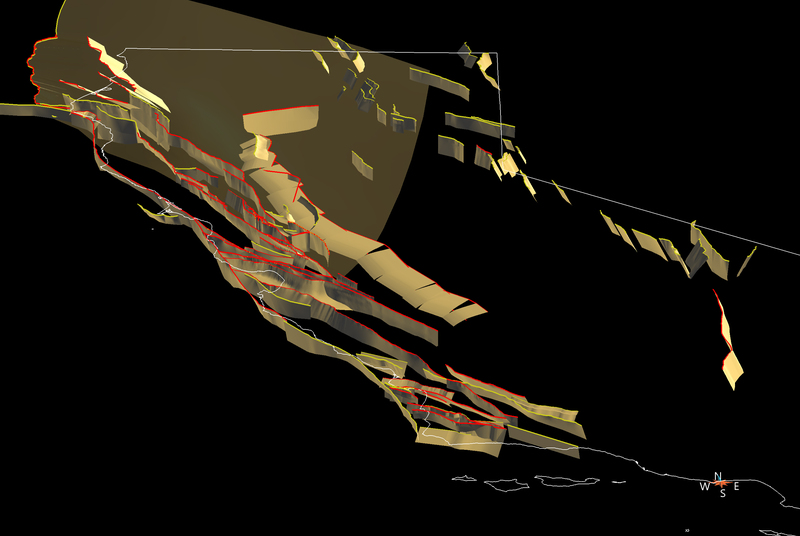 Perspective view of the San Jacinto Fault system in CFM 5.0. The San Jacinto and many other fault representations in the model have been made more compatible with detailed surface traces from the USGS Quaternary Fault & Fold Database (red traces) and relocated seismicity (blue) (Lin et al., 2007; Yang et al., 2012; Hauksson et al., 2012). As a result, these fault representations are more precise and – as shown here for the San Jacinto Fault – are more highly segmented. Figure 2. Perspective view of the SCEC northern California fault model, which together with the CFM comprises the Statewide Community Fault Model (SCFM). Fault traces in red have one or more alternative representations. Figure 3. Perspective view of components of the Unified Structural Representation (USR). 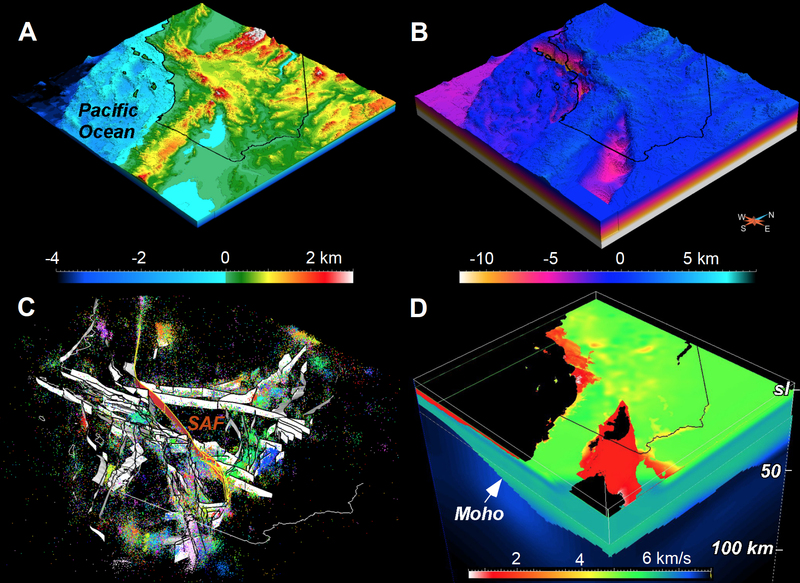 A) Topography and bathymetry; B) top basement surface; C) Community Fault Model (CFM) (Plesch et al., 2007); and D) USR showing Vp. SAF is the San Andreas Fault. Topographic and bathymetric surfaces are derived from USGS 3″ digital elevation model data and a National Oceanic and Atmospheric Administration 30″ grid (TerrainBase). SCEC has engaged in a major effort to refine systematically the Community Fault Model (CFM) using detailed fault traces from the USGS Quaternary Fault & Fold Database, precisely relocated earthquake hypocenters, and new focal mechanism catalogs. This results in fault representations that are more precise, and often more highly segmented than in previous model versions (Figure 1). The first new model version incorporating these updates (CFM 5.0) was released at the 2014 Annual meeting, and this past year further refinements have been made with an emphasis on the Peninsular Ranges, Santa Barbara Channel, Transverse Ranges, and Mojave Desert regions. As part of this process, we have also developed detailed sets of fault representations in the Ventura Basin and San Gorgonio Pass regions, which are the focus of the SCEC Special fault Study Areas (SFSA’s). These new updates will be made available in a forthcoming model release. In addition, we facilitated a formal evaluation of the northern California fault model, which together with CFM 5.0 comprises the SCEC Statewide Community Fault Model (SCFM). The northern California models consists of more than 150 fault representations, many of which include sets of alternative representations (Figure 2). To facilitate the review, we provided the fault representations along with a spreadsheet with fault metadata to the evaluation group, which is comprised of scientists from SCEC, the USGS, and CGS. Evaluators were instructed to use SCEC VDO software to view and assess the fault representations. To coordinate this activity, we held a kick-off evaluation meeting at the USGS in Menlo Park (May 2015). Participants provided rankings for alternative fault representations, which are used to define the set of faults that define the preferred model version (SCFM v. 3.0). T-surfaces (Tsurfs) were chosen as the native format for CFM and SCFM faults because they provide for more accurate representations of complex, curviplanar surfaces that vary their geometries in depth or along strike. However, many fault system modeling tools, including most earthquake simulators, require either rectangular dislocations or more regularly gridded Tsurfs. Thus, through a coordinated effort involving several SCEC investigators we have developed sets of regularly meshed tsurfs. As a result of this process, we also developed a set of refined fault map traces. The concept of a Unified Structural Representation (USR) has been pioneered by the SCEC Community to support a wide range of earthquake science and hazard assessment efforts. The SCEC USR for southern California is a three-dimensional description of crust and upper mantle structure consisting of interrelated Community Fault (CFM) and Velocity (CVM) models (Figure 3). The development of these models has been inspired by recent advances in numerical methods and parallel computing technology that have enabled large-scale 3D simulations of seismic wavefields in realistic earth models. SCEC released its first formal USR version this year (Shaw et al., 2015), consisting of CFM 5.0 and CVM-H 15.1.0. The CVM component of this model includes a series of updates to the basin representations in the model, which are compatible with the locations and displacements of major faults in the CFM. The USR also includes a Geotechnical layer (GTL) that describes near surface velocities, and has been iterated using 3D adjoint waveform tomography. This model, as well as alternative velocity representations supported by SCEC, are actively being tested by comparison of observed and synthetic waveforms for earthquakes in southern California. Another related, current effort is focused on the implementation of statistical representations of small-scale velocity heterogeneity in these models, which offers the prospect of accurately simulating seismic waveforms to higher frequencies. As a natural extension of these efforts, we also began development of a new USR for Central California in support of the newly established Central California Seismic Project (CCSP). The CCSP study area extends from the Transverse Ranges in southern California north to the Santa Cruz Mountains in the Pacific Coast Ranges, and from the Pacific plate east across the Great Valley and Sierra Nevada Ranges. This area effectively lies north of the current SCEC USR for southern California. Thus, development of the central California USR involved building a new model of the Central Valley, including the San Joaquin and southernmost Sacramento Valley basins. These basin structures were constrained using tens of thousands of direct velocity measurements from wells and seismic surveys, and incorporate the latest fault representations from the southern and northern California Community fault models. In the coming months, these new fault and velocity representations will be used to facilitate 3D waveform tomographic inversions that will help to improve our understanding of regional velocity structure and reduce uncertainties due to path effects in calculated strong ground motions.